Should I Use Flat or Semi-Gloss Paint on Living Room Walls? Faux painting techniques are becoming increasingly popular because of the dramatic effect they create in a room. Opalescent and pearlescent paint are two possibilities to consider for your next interior renovation project. Use a thick roller when rolling pearlescent paint onto a textured wall. The advantage of using these kinds of paints is that the sheen brightens your room by reflecting some of the light that shines on it. You can use pearlescent paint to create either subtle or dramatic stripes in a room. For a more subtle effect, choose a pearlescent shade of paint that is close or nearly identical to the color of base coat you plan to use. Measure your room to determine how wide of a stripe would divide your room evenly. Paint two coats of your base coat, then mark and tape off your your stripes. Use a roller to paint on the pearlescent shade of paint. The rag rolling technique creates a marbled effect on a wall. One way to accomplish this is to use a slightly darker color for your base coat and a lighter opalescent color for top coat. Wet the rag in clean water, roll it up and roll it lightly through the paint. Roll this over your wall after you have prepared it with two coats of your base coat. Paint your wall with two coats of a base coat. 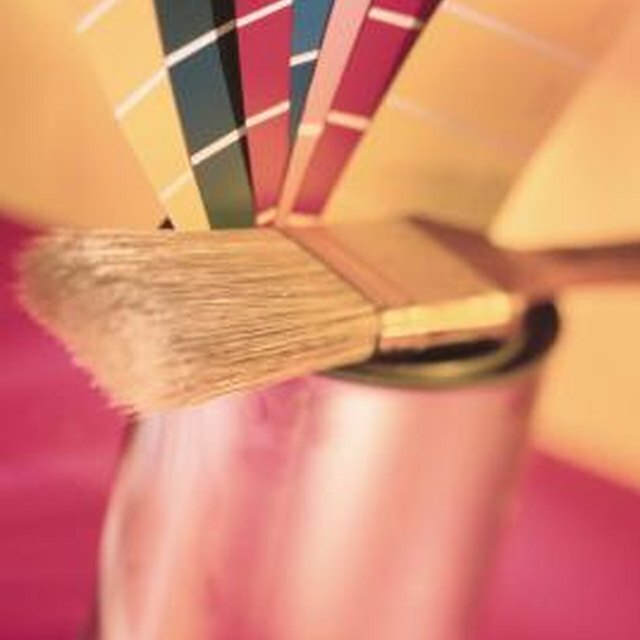 Choose a color that is close to the same as the opalescent paint you plan to use. Also paint the ceiling of the room with the base coat. Use a brush or a sponge to paint two layers of the opalescent paint on the walls. Trying painting two opposing walls at a time, taping off the adjacent walls so you do not have an unwanted buildup of paint. Use plaster to create a texture on your wall. You can use a spatula or comb to create lines, peaks or radiating circles. Wait until the plaster is dry. Using a thick roller, paint two layers of a base coat over the plastered wall and let it dry. Then paint two layers of a pearlescent paint that is slightly lighter than your base coat over the wall.